A Website For Them. Control For You. Easy, Unique Content for Everyone. How can franchiseME!™ help me? See the “All Features & Costs” tab above for more information. Interested in more info or a quote for your franchise website solution? See the “Live Case Study” tab above for more information. *Costs are representational and are subject to change based on project specifications. 3RING.com reserves the right to change, alter or edit the costs represented above at any time for any reason deemed necessary. 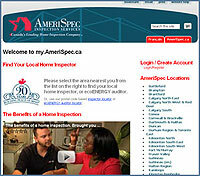 www.AmeriSpec.ca – daughter company of another long time 3RING.com client, ServiceMaster www.ServiceMaster.ca, an internationally recognized franchise based company. 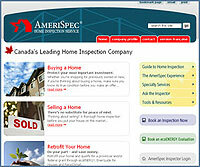 The AmeriSpec.ca corporate website has been continuously praised as the most attractive website in the home inspection industry, as well as being highly functional. 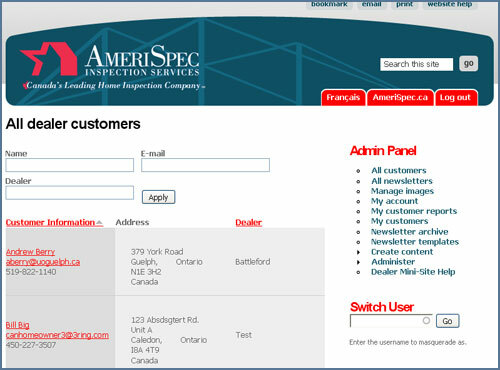 In addition to serving both Canadian languages, the functionality allows corporate admin to easily edit the site content, add new pages, add promotional campaigns, add video, images, links and contact forms, as well as manage dealer (franchisee) information that gets displayed in the dealer locator (see below). 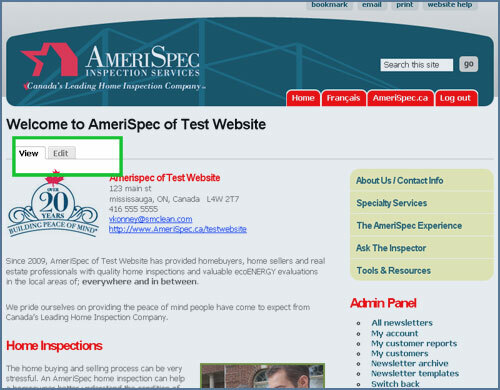 This zip/postal code based locator allows website visitors to simply enter the first 3 characters of their postal code, and the system provides full contact info for the AmeriSpec Home Inspector closest to the location given. Versions can also include search by city, area code, and map. 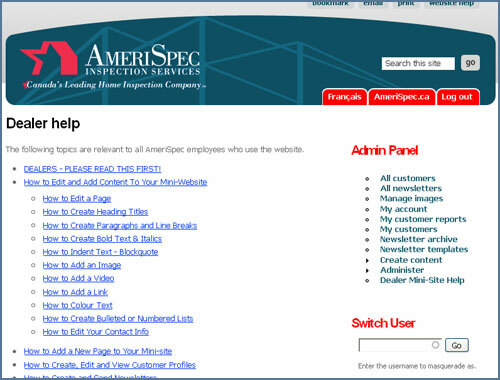 AmeriSpec Canada wanted to set themselves apart from their American sister franchises, as well as become independent of the restrictive US content management system that was unable to accommodate language requirements in Canada. By redesigning the old dealer websites to be branded exactly like the new Canadian mother site, as well as replacing & redeveloping the legacy content management system with a new, much easier to use and manage system that integrated several critical marketing functions, 3RING.com was able to provide the most advanced franchise website management and marketing tool ever offered – franchiseME!™. 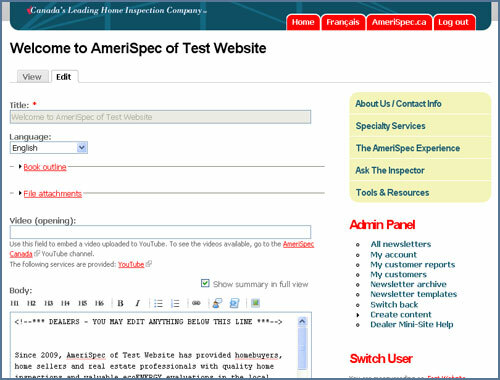 Franchisees can update their own websites, all macro-manageable by AmeriSpec Head Office. Once logged in, the “Edit” and “View” buttons appear on every page editable by the franchisee. They just click “Edit” to make their changes. After clicking “Edit, this is where the franchisee or website admin can make changes to the page content, making it completely unique from other franchisee pages. Franchisees and corporate admin can create, edit and delete customer user accounts. These accounts are used for newsletter mailings as well as delivering password protected downloadable inspection reports. Management can search the customer database by franchisee, customer name or email, then contact, edit or delete the customer. Franchisees or management can create newsletter templates or use existing templates, then send newsletters to their customer database at any time. 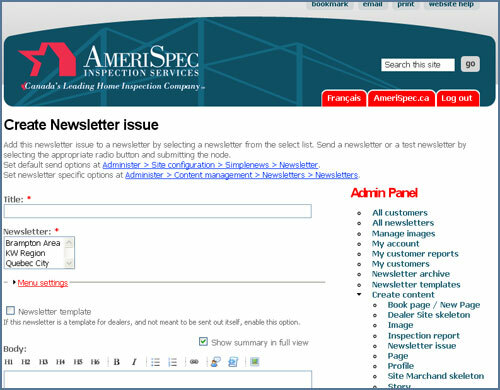 Newsletter templates can be simple text, or full HTML, and sent at any time. Franchisees and managment has access to detailed help pages with accompanying videos that clearly explain how to use each function of the website, including using special tags to create custom page layouts. The Help / Support area. Franchisees can use the online help, or contact support directly.